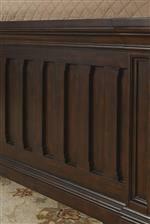 Modern function and classic style combine in this executive credenza. 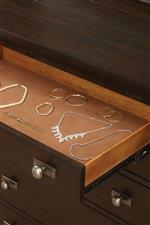 The piece offers great storage, with a locking file drawer, CPU storage, multiple utility drawers, and accessories like pencil trays and removable dividers. 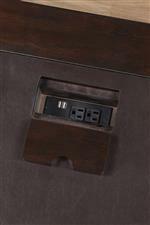 A hidden charging station with two electrical outlets and two USB ports promises modern convenience, making it easy to connect your laptop or desktop computer. Bracket feet, side moldings, and a deep brown finish complete the desk's traditional appearance. The Walnut Creek Executive Credenza with Charging Station by Flexsteel Wynwood Collection at AHFA in the area. Product availability may vary. Contact us for the most current availability on this product. Case Construction Quality veneers and solid poplar wood.